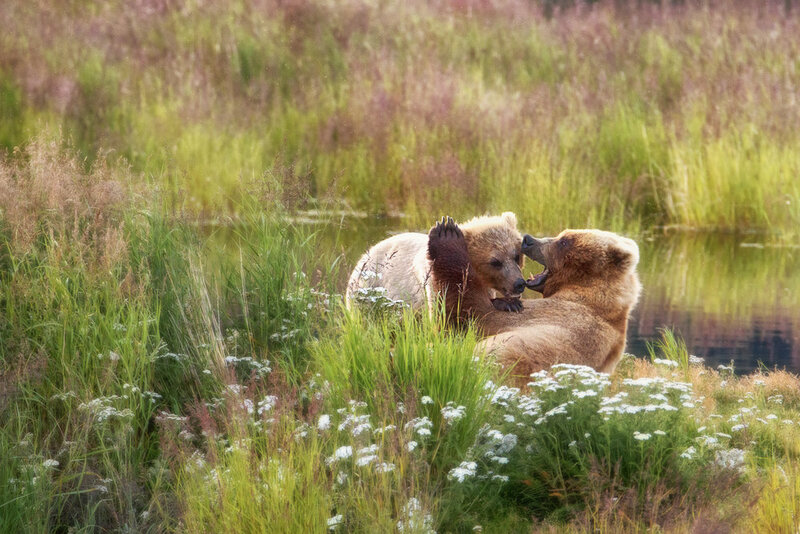 Katmai National Park is only accessible by plane, so plan your travels accordingly. You’ll fly to the small city of King Salmon then take a seaplane to Brooks Lodge where you’ll set up camp. Preferably you’d want to book your campsite or cabin in January when they first open up on https://www.nps.gov/katm/planyourvisit/plyovicamp.htm, but there are occasionally cancelations later on that you can snag if you’re vigilant. Some people prefer to spend the extra bucks for the cabins, but quite honestly it’s a huge waste of money. You’ll spend more time with the wildlife and nature than your cabin, and you can still pay for a shower whether or not you’re a cabin guest. Plus the campground is safe and comfortable. We didn’t find out about Katmai National Park until June, so of course all the cabins and camp spots were booked. We were left wondering what else could be done. After some research we learned that if you can’t book a spot in Brooks Camp you get to camp in the backcountry. The thought of getting eaten by bears freaked me out. I thought, how could they encourage visitors to camp in such a bear-crowded place? We later learned that camping outside of Brooks Camp isn’t as scary as you’d think. Brooks Lodge lets visitors borrow bear canisters for free, give people ideas of where to set up camp (Dumpling Mountain and the road toward the Valley of Ten Thousand Smokes have some great spots), and tell people how to safely react to bears. They’ll even keep an eye out for last minute cancellations in the campground or cabins if you ask. If you choose to camp away from Brooks Lodge, you'll have to camp in the backcountry. It's mostly a long walk if you choose to follow the road toward the Valley of Ten Thousand Smokes, but it's a decent hike if you try to find a spot on Dumpling Mountain. Especially depending on how much gear you have to trek up with you. If you've never backpacked before, I don't suggest starting in Katmai... But I'm sure you'll have an adventurous story to tell if you do. And just to reiterate, you don’t need to worry about bears sneaking into your tent as long as you follow bear safety guidelines. They’d much rather eat the salmon than you. The thought of backcountry camping around so many bears really scared us. At the time we weren't experienced backpackers, let alone comfortable around bears. (If we went back again we'd definitely be up for it!) Even still, we booked our plane tickets to Brooks Camp, purchased shuttle bus tickets to the Valley of Ten Thousands Smokes, and then checked the NPS site religiously in the hopes that a camp spot would open up. And by some crazy miracle, a campsite actually opened up in July within our travel dates. We immediately booked the only available night and planned to sleep in the valley for one and the backcountry for the other. Kevin and I did most of our research on https://www.nps.gov/katm/index.htm and http://www.katmailand.com/ and suggest you do the same. KatmaiLand offers so many activities and packages that are well worth the cost, so spend as much time as you need to plan your trip. If it’s possible, try to spend at least four days in Katmai to fully enjoy it. Both websites offer helpful information about what to pack and what to expect when you get there. We packed our tent and camping gear, backpacking packs with bladders, dehydrated food, dried fruits and nuts, warm clothes (merino wool layers, puff jackets, shells, etc. ), sun block, bug spray, Jetboil, and camera gear. You can’t bring bear spray or propane canisters with you since you have to fly there, but luckily Brooks Camp has camp stove fuel at the Trading Post. Bear spray and guns aren’t allowed, but I’ll explain why you don’t need those a little later on. Oh and if you plan on going fishing they provide a frozen storage area to keep your catch fresh—just don’t expect there to be any ice for your personal cooler. Since we wanted to spend most of our time watching the bears and backpacking in the Valley of Ten Thousands Smokes, we made sure to pack as light as possible. Not everyone needs to bring the gear we packed, and in fact, most people who stayed in the campground brought regular food and bulkier gear without any issues since Brooks Lodge offers convenient wheelbarrows to lighten the load. After we landed in King Salmon we boarded the bus shuttle to Peninsula Airways and waited about an hour for the scheduled flight. The pilots were super friendly and the other passengers were just as happy to fly as we were. Getting on the seaplane was easy enough and the ride was loud and bumpy with gorgeous views of the lakes and green scenery below. After we landed, we waited on the beach for our shuttle bus. Normally the seaplanes land closer to Brooks Camp but the wind was too high that day. The ride was short and bumpy before stopping just outside the lower river platform. And within seconds of stepping off the bus, we encountered our first “bear jam.” This is when a bear (or bears) are literally blocking the path. So after about ten minutes of watching a bear from the safety of the viewing platform, we finally headed to the visitor center to watch a short bear safety video about that felt reminiscent of the Poler Camp Vibes video. After a short 0.3-mile walk from the visitor center we noticed an electric fence surrounding the campground. The entrance gate was easy for humans to open and led us to the communal area. There were designated areas to pitch a tent, cook, store fuel and food, relax by the fire, eat food, and sinks to wash dishware or fill up bottles/bladders. The set areas were taken seriously because even though the electric fence deterred bears, you could never be too careful. We pitched our tent in a quiet spot and attached our assigned number that the visitor center gave us. We noticed that each camp spot was spaced out comfortably and surrounded by tall grass so it felt private and easy to relax. At this point most of the day was over, so we packed a small satchel with water and bug spray and headed to Brooks Falls. The 1.4-mile trek was paved and easy to traverse, even though I was incredibly sick with a nasty virus. When we entered the platform we saw a sleeping mama bear with her three cubs hidden in the trees. We must’ve watched her for at least a half hour before wandering to the main falls platform to see the rest of the bears waiting for salmon. We stayed for a couple more hours before calling it a day and headed back to the lodge for some hot tea. Just a heads up, The Falls are closed from 10pm-7am. There’s usually a wait list during the middle of the day so if you want to avoid waiting in line, go early in the morning and late at night. We woke up early the next morning, ate a quick breakfast, and headed to the falls. As we crossed the floating river platform we ran into a mama bear and her teen cub swimming in the distance. Once they disappeared out of view we walked to the falls and stayed for an hour or two. 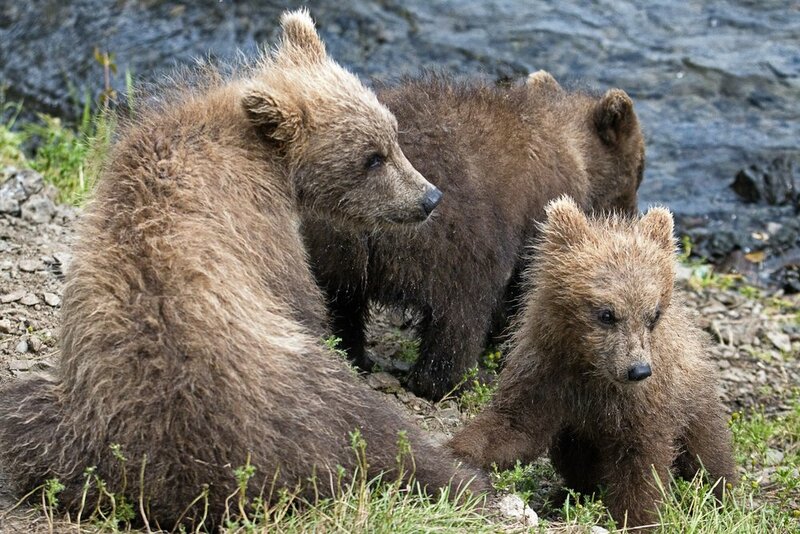 We watched the same mama bear from the night before play with her three cubs at the waterfall and fell in love with the adorable scene. I may have been dying from stuffed sinuses and crippling fatigue, but I couldn’t have been happier. As we headed back toward camp for lunch, we were escorted down the trail by a ranger to avoid a sleeping bear. We got stopped multiple times on the way back by a bear and two cubs, a fat bear jam at the bridge, two swimming bears 100 yards away, and a mom and cub swimming across the lake. We encountered a few more bear jams after lunch on our way back to the falls. We felt complete after three hours at brooks falls. 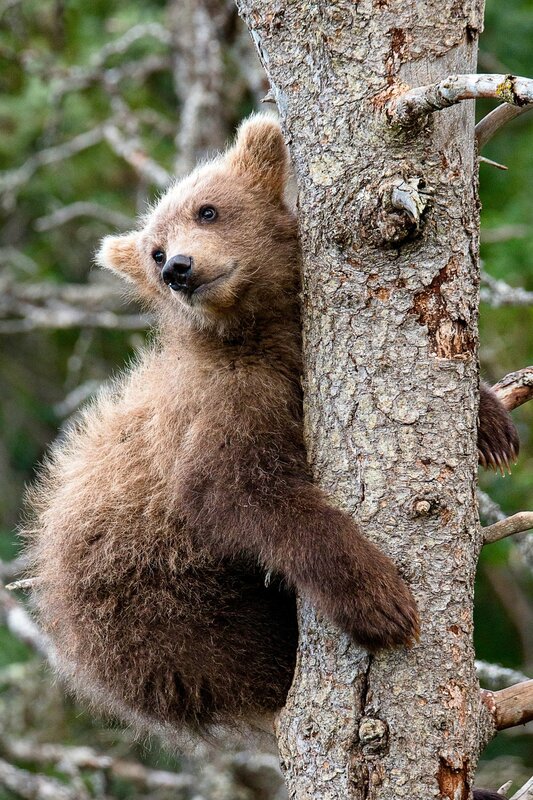 We saw a mom guard her three small cubs as they hung in a tree, a different mom with two older cubs bluff charge a young bear, big fat bears belly flop to catch fish, snorkeling bears, soaring eagles, and Rebeardo (AKA Otis), the lazy bear who sat in the same spot for three hours and barely moved. We also watched a bear do the cowboy walk and rub on a tree to show dominance before bluff charging, as well as a female get chased around by a huge male trying to tire her out in an attempt to eventually mate. On our way back to camp around 9PM, the river bridge was closed due to a sow swimming around while her two big cubs wrestled each other nearby. We watched in awe for 20 minutes and took as many pictures as possible. The sun was setting behind the hills, illuminating the still water and vibrant meadow in a blanket of brilliant pinks and purples. We felt like we were a part of nature, observing from afar yet silently participating in the beautiful moment. The bears continuously played while their mom swam lazily through the glowing water. This scene is one we'll never forget... it was like time stood still. We made it back to the lodge and ordered a beer for Kevin and a hot tea for my sick self. Not even ten minutes later, a mama bear and her cub walked outside the window, curiously wandering around and nibbling at the grass. A ranger quickly scared them off, but five minutes later they sneaked back. As she scared them away again, a different sow and her two small cubs showed up on the other side of the lodge, essentially blocking all exits. The ranger ended up needing to call backup. She scared the first pair away while another ranger scared the new family away. That is, until they came back again. The third day we took the shuttle bus to the Valley of 10,000 Smokes, which is just as amazing as Brooks Falls in its own way. The ride took about an hour and a half along a bumpy dirt road, and at one point we had to wait for a mama bear and her two cubs to move out of the road to pass. The one-hour mark is about when the bus crossed the river, which was really cool to witness. Though I mostly slept through the ride since I was still very sick. The bus parked at the visitor center and everyone ate their prepaid lunches while the ranger told the history of the volcano that erupted to create the valley. The ranger later showed us where to backpack on a big visual map, which was very helpful and informative. And even though one-way passengers (like us) don't get meals, the rangers let us eat the leftovers (salad wraps and sandwiches, potato chips, oranges and apples) and drink their coffee, water, and hot tea. Such nice people! We ended up backpacking with two new friends that we met way back on our seaplane ride, named Fuzzy and Todd. Since there’s safety in numbers and new friends are always a plus, the four of us trekked into the valley to find a killer camp spot. There were tons of sights to see along the way, including a bear running up the peak on the side. We even watched a plane fly across the valley and land in the distance, most likely trying to explore the nearby mountains. After about 3.5 hours of hiking, we made it to the spot that looked like the campsite the rangers spoke about. There were spaces for tents, a lovely waterfall, and a little bit of wind protection. Luckily we hiked the extra half mile or so past that spot and found the right site. The real campsite was much, much larger than the little one by the waterfall, and it had a much prettier view. There were multiple spots to set up our tent, great wind coverage, and running water nearby. The next morning, we hiked the six miles back to the visitor center, but accidentally followed the wrong trail to the river... very bad idea. The water was much higher and faster than it was when we first crossed the day before, so we had to climb over an island covered in thick brush to get across. If this happens to you, my advice is to go back the way you came and find the correct trail. Don’t always trust a well-traveled trail! Too many people make cairns in the wrong places in the backcountry. We had to make it back to the visitor center by 2:30PM to be picked up, but luckily we made it back in time to relax, drink some coffee and water, and eat the leftover cookies from the group lunches. The ranger told us that they saw a lynx on the way up to the valley, but sadly we didn’t see any wildlife on our drive back. Honestly we were just happy to be sitting down. Kevin headed to the bathroom and by some crazy luck ran into a friend we met up with a few times at the falls over the last few days. He told Kevin that he was on his way to catch an early flight out, which meant his campsite was up for grabs that night. He hadn't told the visitor center yet, so he gave us his first and last name so we could camp at his spot. We immediately went back to the visitor center to let them know what happened, but they were understandably skeptical. We told them that if there was no tent on that site later that night we'd take it. Since we knew we'd be able to snag the spot, we cruised over to the falls again to watch some more bears. We ended up sharing our newfound campsite with Fuzzy and Todd, who by coincidence planned on camping on Dumpling Mountain that night as well. They told us that they camped on the mountain their first night and had an extremely close encounter with a bear. We spent the night talking, laughing, drinking beer, and playing Uno before heading to bed. Sadly we had to leave Katmai that next morning, but we felt satisfied for how much we had seen so far. For our final hours at Katmai, we ate some lunch at Brooks Lodge, tried to see more bears, and watched part of a great documentary, "The Ends of the Earth" in the visitor center. We could have spent weeks exploring Katmai, and we vowed to come back in a few years to see more. We spent roughly $1700 total for our mini vacation, including plane tickets and food. If you fly from another state or book different touring activities (like fishing with the bears), you'll probably spend more. But just plan on saving $2000-$3000 for two people to enjoy the park.